A COSY, COOL, CHEAP AND FUN WAY TO VISIT ROME !!! 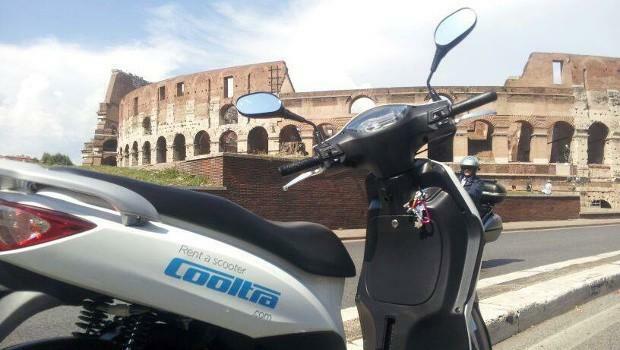 VISIT ROME IN ONE DAY ON A SCOOTER – Rome scooter tour escorted full day sightseeing tour. 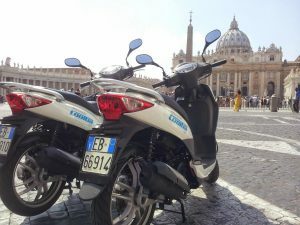 Rome scooter tours full day – Rome in one day tour by scooter – Rome Highlights in one day scooter tour, One day Rome city tours, Visit the best of Rome in one day by scooter city tour, Rome in one day guided tour, Rome in a day scooter sightseeing tour. Highlights one day tour in Rome 1 day. 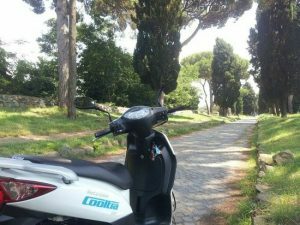 Rome scooter tours – With ‘authentic Roman’ drivers and tour guide you will discover the Eternal City. Rome the Highlights by scooter. The most famous sites by scooter for a full day tour of Rome! Rome scooter tours full day – Meeting at our office right beside one of the major basilicas of Rome, Santa Maria Maggiore, where we pick up the scooters and begin the tour. Leaving our travel agency our first stop will be at the monumental Colosseum, the symbol of the ancient Roman world, one of the most visited attractions of the world. Then continue towards Circus Maximus, where chariot races were held, to see the tracks where 180 thousand inflamed spectators could fervently incite their favourite heroes the site of an ancient circus. On the way to the Catacombs we will have the opportunity to admire the great ruins of the Baths of Caracalla. Driving long the ancient Appian Way, between the ruins of numerous Roman tombs, we will reach the Catacombs to visit some of the 150 kilometres of underground tunnels and galleries used as cemeteries by early Christians under Roman persecutions. After the tour of the Catacombs we will go towards to the Aventino hill with the view on the sprawling Emperors’ Palaces on Palatine Hill. Passing Marcello’s Theatre the tour will go though the most central square of Rome, called Piazza Venezia or Venice Square, where you can admire the Monument of King Victor Emanuel II, who is credited for the unification of Italy. Then continue your drive to admire the well-preserved Temples of Hercules and of Portunus situated on the banks of the Tiber. Lunch break next to the authentic spot of Julius Caesar’s assassination on the Ides of March, 44 B.C. and now refuge to thousands of street-cats. Soon after the lunch break we will Continue towards Piazza della Rotonda, where you can admire an architectural wonder and also one of the best preserved monuments of the Ancient Roman world, the Pantheon. Driving amongst the little cobblestoned streets you will reach Piazza Navona, a square that is built on the site of an ancient stadium of Domitian. After Navona square we will drive to the Quirinal Palace, official residence of the Italian President originally built by Popes in the 1580’s as their splendid summer residence . Descend to the cascading waters of the Trevi Fountain, the grandest of Rome’s baroque fountains, still fed by an ancient 19 BC roman aqueduct and toss a coin into its gushing sprays to propitiate a sure return-visit to the Eternal City. Then we will continue with the scooters to see the Castle of the Holy Angel (Castel Sant’Angelo) on the Tiber River. Originally it was commissioned by Emperor Hadrian as a mausoleum for himself. Later the building was used by the popes as a fortress. From here we can see one of the largest churches of the world, St Peter’s Basilica. It is one of the most prominent work of renaissance geniuses Bramante, Michelangelo, Carlo Maderno and Gianlorenzo Bernini. Our last stop will be the Janiculum hill with its spectacular view over the city. End of the tour back to our office. End of the tour return to the agency. For custom scooter tours FOR BIG GROUPS or INDIVIDUALS send your request.